Book Delves into the Mysteries of the 'Mighty Fitz' Michael Schumacher, author of Mighty Fitz: The Sinking of the Edmund Fitzgerald, talks about the ship's history and its disappearance 30 years ago. 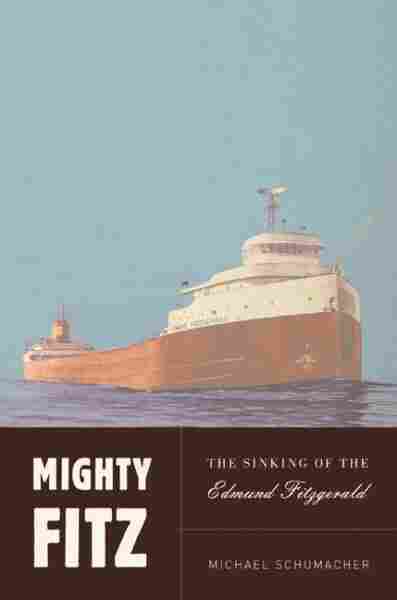 Michael Schumacher, author of Mighty Fitz: The Sinking of the Edmund Fitzgerald, talks about the ship's history and its disappearance 30 years ago. Thirty years ago today, amidst the gales of November, the SS Edmund Fitzgerald sank on Lake Superior. All 29 crew members on board died. The wreck was a horrible event for those men, their families and the communities around the Great Lakes, but it was a song by Gordon Lightfoot that brought the story of the shipwreck to much of the country. Mr. GORDON LIGHTFOOT: (Singing) The legend lives on from the Chippewa on down at the big lake they call Gitche Gumee. The lake, it is said, never gives up her dead when the skies of November turn gloomy. NORRIS: Lightfoot wrote that song almost 30 years ago. Lots of people still remember those poetic lyrics; at least that was the case among the people we spoke to around Washington, DC. Mr. ARRIS JIS(ph): Arris Jis, Cheverlee(ph), Maryland. (Singing) The legend lives on from the Chippewa on down of the big lake they call Witche Gumee. Mr. JIS: Oh, I think that's about all I can give you. Edmund Fitzgerald, yeah. It's actually a ship, huh? Mr. AARONS: ...turn gloomy--or the skies of November. Great song. NORRIS: And for people who hail from the Great Lakes region, the song has even more meaning. Ms. ANGELA BENANDER: Angela Benander, communications director for Senator Debbie Stabenow of Michigan. We would sing it every November in music class. I remember sitting at our desks and they would pass out the lyrics and we'd have to sing it to commemorate the Edmund Fitzgerald. My favorite part is the part that they say Gitche Gumee, but I also like `where the papers all say they'd have made Whitefish Bay if she'd put 15 more miles behind her.' So close. Mr. BOB MEISSNER: My name is Bob Meissner, press secretary for US Senator Debbie Stabenow. The lines that come into my head all the time are `Does anyone know where the love of God goes when the seas turn the minutes to hours?' I've seen the gales on the Great Lakes and I know what they're like and I know what that day must have been like. NORRIS: The Edmund Fitzgerald was headed from Superior, Wisconsin, to Detroit, hauling more than 26,000 tons of taconite, a type of low-grade iron. It was an enormous ship, two city blocks long and several stories high. The ship tried to forge through an intense storm with 30-foot waves and wind gusts of 90 miles an hour. Just past 7:00 that evening, the Edmund Fitzgerald ended radio communication with a nearby ship and mysteriously dropped off the radar. There was an investigation but to this day theories abound about what caused the Edmund Fitzgerald to go down. Earlier today I spoke with Michael Schumacher, author of the book the "Mighty Fitz: The Sinking of the Edmund Fitzgerald." Here's what he thinks may have happened. Mr. MICHAEL SCHUMACHER (Author, "Mighty Fitz: The Sinking of the Edmund Fitzgerald"): I really personally think that it's a combination of the two most popular theories, that it probably grounded or hogged, causing a fracture in the hull somewhere below the water line that was letting in water. At the same time, as the Coast Guard concluded, it was taking in a massive amount of water over the decks and that was leaking through the hatch covers. But I think for something this big and this powerful and this modern to have sunk the way it did, it probably took a combination of things. It wasn't going to go down easily, and it didn't. It almost made it despite some of its problems. NORRIS: ...and you imagined what it must have been like to be on that ship. NORRIS: Could you read a section for us? Mr. SCHUMACHER: Sure. `Throughout the tortured final moments of the Edmund Fitzgerald, the middle of the ship continued to twist and break. Hatch covers blew out, scattering taconite everywhere. The running lights flickered and went out. The ship's two lifeboats broke free and rose with other flotsam toward the surface. The Fitz finally broke apart, the torque in the middle of the ship twisting the stern until it was actually upside-down when it broke away from the rest of the ship and dropped to the lake bottom floor. The bow came to a halt. The little air remaining in the Fitzgerald escaped and bubbled upward. NORRIS: Michael, was it difficult for you to write that passage? Mr. SCHUMACHER: Yeah, it was, actually. It's strange because when you have a day like today, which is the 30th anniversary, I find myself thinking throughout the day of where was the Fitz at this moment? What was going through those guys' minds and so forth. And in talking to some of the family members of the Edmund Fitzgerald, it was very difficult for them to imagine their loved one--their father, their brother, their uncle, their grandfather, their husband, whatever--actually going through this. You know, you don't want to think of somebody suffering. You don't want to think of somebody drowning. It's a terrible thing. And so when you're writing this passage, it can't help but be a very moving thing to write about. You want to give people an accurate account and a real feel for what it must be like for something this massive to sink. You see these things and you do not believe that it's humanly possible for something like this to sink. And now you have to write about its happening. NORRIS: What's it been like for the families to live with this legend? Mr. SCHUMACHER: It's been tough. When I was working on the book, research on the book, I would try to contact family members to see if they wanted to become involved. My take on this was that I would ask, but if there was any reason they didn't want to, that was good enough. I wasn't going to try to persuade them or talk them into it or anything like that, mainly because people have different ways of honoring their loved ones' memories, and I wasn't about to stomp on anybody that didn't want to participate. Some are still very, very passionate about it; others are hoping it kind of goes away. They'll remember them, their loved one, themselves, but they don't want the whole nation focusing on this thing. There's always the argument about: Should we have more movies or books or songs or whatever about the Edmund Fitzgerald? When is enough enough? While they want their loved ones' memories preserved, they don't want this memory to be preserved at the cost of, say, crass commercialism. NORRIS: Michael Schumacher, thank you so much for talking to us. Mr. SCHUMACHER: Thank you for having me. NORRIS: Michael Schumacher is the author of the book the "Mighty Fitz: The Sinking of the Edmund Fitzgerald." Mr. LIGHTFOOT: (Singing) In a musty old hall in Detroit they prayed in the maritime sailors cathedral. The church bell chimed, it rang 29 times for each man on the Edmund Fitzgerald. The legend lives on from the Chippewa on down of the big lake they call Gitche Gumee. Superior, they said, never gives up her dead when the gales of November come early.